We've been contemplating re-doing our bedroom and I really want this bedding in natural. Would cream bedding be a disaster with small children? Just make sure whatever you get is washable! We have issues with light colored bedding because of a small, black dog . . . we try to keep the kids out of the bed unless it is unmade and we are all in it. I got a cream duvet cover abt 3 months ago---so far so good. Just make sure its easy to wash. I LOVE this one pictured. 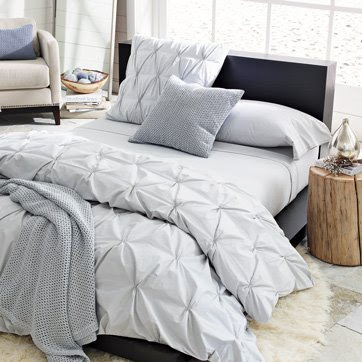 this bedding is fab...I have a few friends obsessed with white bedding/cream bedding. I would be scared just because my kids love to jump on my bed...you would just have to be vigilant with them and no shoes for sure!! My kids got toothpaste on my bed last week. I love the color, similar one on Garnet Hill. I think with small kids it would always be dirty. I have white bedding and a 2 year old. No problems. I've been coveting this same duvet cover for a long time! diddo the washable aspect. but i have all white bedding in my house (even my two year old's room) and it's been no problem. i think i've only to use a spot cleaner once. my rule is that no food or drinks (except water, maybe milk) are allowed on the bed. and messy foods are kept at the table or the high chair. i say go for it! i've been contemplating the same bedding for my own bed. i actually got a white comforter for my 6 year old from crate & barrel about 2 years ago and it's held up pretty well. we get the occasional pen mark (in fact there's currently a purple pen streak) or footprint but it still works. Oh, so beautiful! No problem with kids- just don't let them into the bedroom! Oh yes it would! For some dumb reason I decided to do white rubs and white towels for my bathroom that has dark tile everywhere. It looks great but th ekids.....it was not to smart! My husband and I have all white bedding. We have had it for five years and we absolutely love it. There is nothing worse than a drool stain on your colored pillow case. I was contemplating getting this exact bedding, but read reviews on it that it is difficult to keep looking nice, because it is hard to iron and the pin tucks come out easy. Let me know if you get it... I'd love to hear what you think.